amyalaska: What I've Been Up To..
Firstly I'd like to apologise for the lack of posts recently - I've been so busy! I don't think I've actually spoken about this on my blog yet, but at the beginning of January I started a new job at Boots Opticians. It's such a relief to be finally working in the same town that I live in, so I get a bit more of a lie-in before each day, but sadly less time to blog. It is only a part-time job at the moment, so really it's just down to my rather bad timekeeping skills! I really do love this blog, and I'm determined to make it one of my main priorities in life, so do keep your eyes peeled for more regular updates. Just a quick post today, but I promise more are on their way! Thanks for reading, and I'd love to hear what you think down below. I like your Terramundi pot. It's great that you have a job that you get a lie-in with too! Haha that soft blanket candle looks so cute! Great little desk space too btw! Congrats on the new job :) definitely takes a little time-balancing at first to get into the swing of things! Oh, it's one of my favourites! :) I'm so happy with how it turned out! I adore white furniture! Im slowly swapping all mine to white! 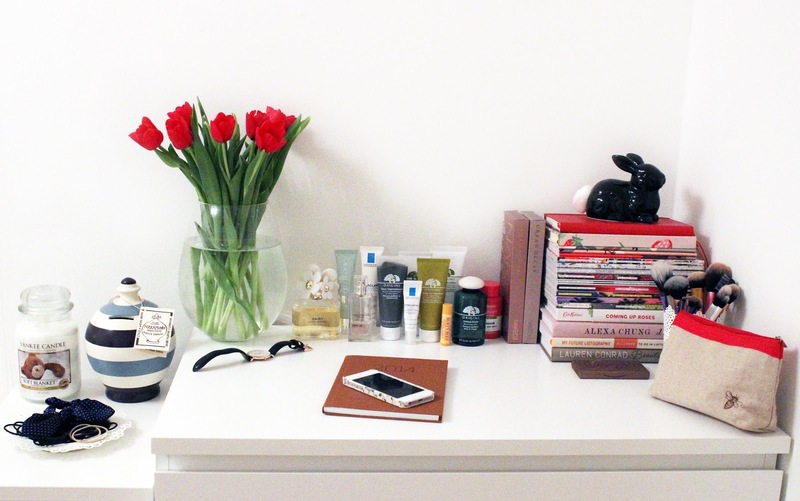 you've inspired me to go out and buy some flowers haha they make your desk look so pretty!! Aw, flowers and bunnies! What could be better? I love the design of your blog - the watercolour features are so so pretty!